Immanuel was organized in 1905 by a small group of German speaking settlers living in and near Parkers Prairie. After worshiping in rented facilities for a few years, they built their own church in 1914 (which still stands as part of their current facility). In 1921 the congregation became large enough to call its own full time pastor. As Immanuel continued to grow it added on to its facility in 1941 and then in 1965 added an education wing. Continued growth has led to the completion of a new fellowship hall, kitchen, gathering space, library, and offices, and new classrooms. Immanuel has 700 baptized members and 550 communicant members. 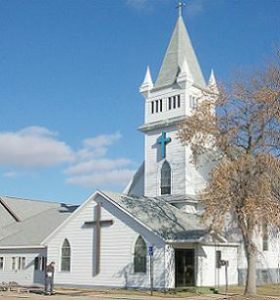 Immanuel Lutheran Church is a congregation of Lutheran Church Missouri Synod.